I hope everyone had a wonderful July 4th! Over the holiday weekend, I made breakfast for us. Our normal weekend breakfast usually consists of scrambled eggs, hash browns and Vermont maple sausages. I know, we’re boring! Well, boring no more. Today’s recipe is inspired from a meal I had a couple of months ago at a pub that Chris and I had brunch at. They had an item called Lamb Ragu with Poached Eggs, which I ordered and it tasted delicious. So I decided to use that idea to make it at home. I took my Beef Empanadas with Olives and Raisins filling and added tomato sauce to it. It was scrumptious! So if you’re trying to cure the breakfast blues, give this dish a try. Have a great weekend! In a large skillet over medium high heat add a little bit of olive oil and ground beef. Crumble and brown meat. Once cooked, use a slotted spoon to transfer meat into a bowl. Set aside. Remove any grease left in the skillet. Drizzle in olive oil and add onions and garlic. Cook until onions soften then add ground cumin, chili powder, and dried oregano. Season with salt and pepper. Then add cooked meat back into the pot, along with tomato paste, olives and raisins. Stir to combine. Pour the sherry and simmer until the liquid has nearly evaporated, about 2-3 minutes. Then stir in tomato sauce. Let the sauce simmer for 15-20 minutes. Remove from heat and taste the sauce. Season with salt and pepper, if necessary. Make 4 wells in the tomato sauce. Crack 1 egg into each well. Transfer skillet into the oven and bake for 15-18 minutes or until desired doneness. Sprinkle with chopped parsley and serve with crusty bread or a side salad. Love protein loaded meals! This looks absolutely mouthwatering! and now I’m craving this in a serious way!! I love me some poached eggs. What a gorgeous looking brunch dish. Great recipe Anne. This looks fabulous. And I love the pics. They look fantastic! Pinning and sharing this on social media! Have a great weekend! Lovely Spanish inspired breakfast. Of course I would want some great crusty bread to get all that great sauce. Yes! That’s exactly what Anne and I were saying while we were eating it. Next time, we shall definitely pair this with some crusty bread. Picadillo – delicious! Cuban boyfriend made this one night. Used his grandmother’s recipe. Thanks for the memories. I now have this recipe on my to make list. Looks delicious Anne, great egg dish paired with awesome sauce. Hi Anne – I like making eggs in tomato sauce but never thought to fix it up with some meat and all that good stuff. What a great idea and great for any meal of the day! Thanks for the inspiration. Your kitchen is one tasty one! you had me at pimiento. so good. My husband would LOVE this! Your picture looks like I could just reach a fork in the screen and take a bite! That looks absolutely scrumptious Anne! I love anything with egg on top, YUM! 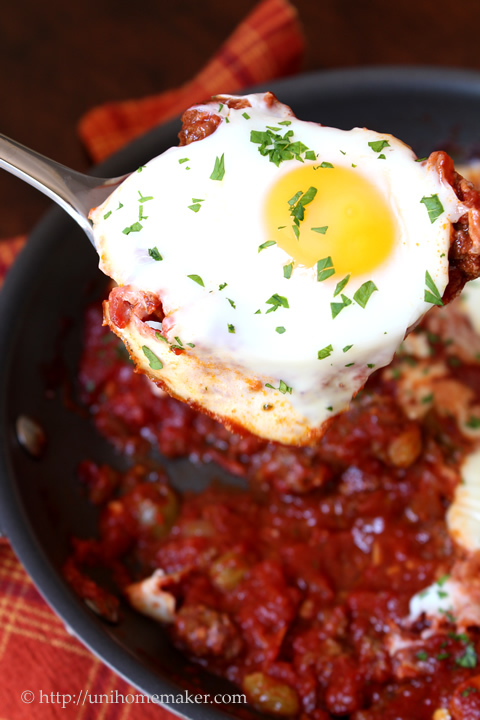 I love baked eggs, but I’ve never had them in this picadillo style. Just popped over from Reeni’s Broccoli Cheddar Soup which I planned on pinning from your board. However, it looks like I may just need to add these Baked Eggs too, they look delicious! Thanks for sharing, Anne. Off to find you on Pinterest! Great photo! 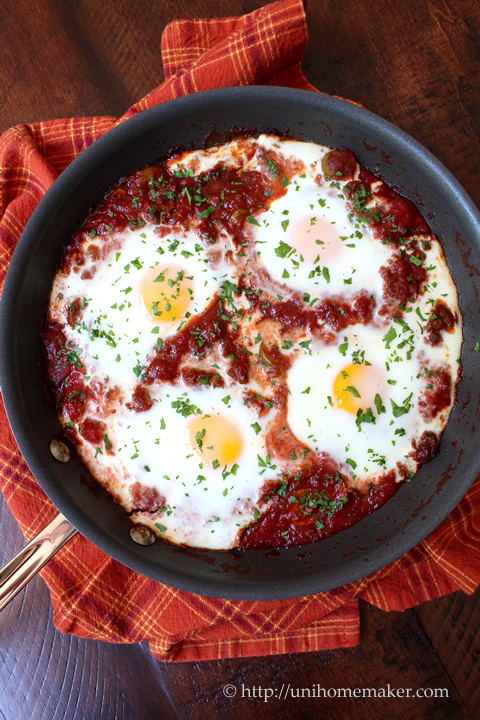 I make a Moroccan dish that uses poached eggs in tomato sauce, but has totally different flavors. This looks so excellent! I really need to try this – it looks wonderful. Thanks so much. This is right up my alley! Bring on some crusty bread and this can be a good good dinner. This is a fantastic breakfast, Anne. It reminds me of Eggs in Purgatory, another baked eggs in tomatoes dish. WIth its Spanish flavors, your version would be a very nice change. And, yes, bring on the crusty bread! This is totally my kind of breakfast! Can’t wait to try this!! Thanks Marie! 🙂 Enjoy your trip to Paris! Anne – this recipe has my name all over it. 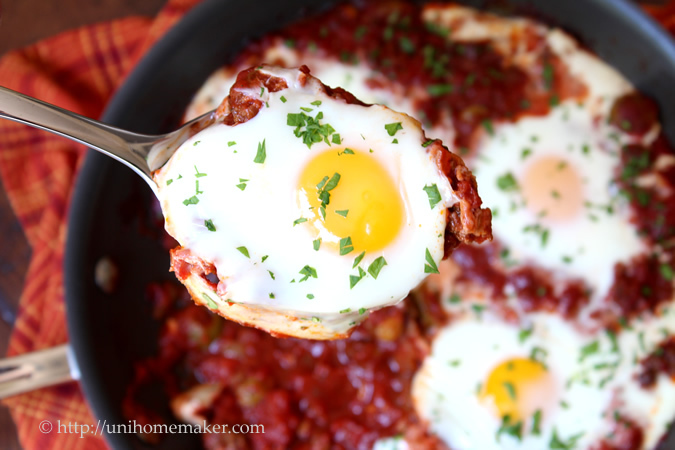 I love baked eggs for breakfast or dinner, and these look so unique. Armed with some crusty bread, I could dive right into that pan! Baked eggs is one of my favorite, thanks for stopping by Jess! What a terrific way to serve eggs…it looks delicious!!! We eat boring eggs for breakfast too often. I have to make this one day! It’s definitely different than your average fried or scrambled eggs. We loved it! Thanks for stopping by. This is both familiar and new to me. 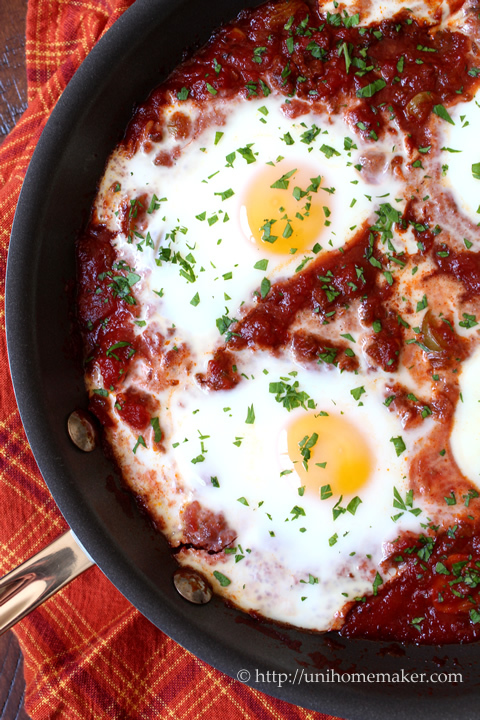 I make shakshouka pretty regularly for dinner, which this resembled, but it seems like the flavor is quite different. I must try it! This looks so scrumptious, Anne! Perfect for a long, lazy brunch. Let the drooling begin! This looks absolutely delicious Anne! I could happily eat that for dinner too! You’re so sweet Reeni! 🙂 Thank you so much for stopping by. Have a great week! I’ve never baked eggs before. These look unbelievable and something I need to try soon! Man, I wish somebody would make this for me! It looks mouthwatering! I’ll give a try soon.. So tempting!! Love baked eggs for brunch! Great dish! I think baked egg dishes are under-rated. A great base like yours and those lovely eggs. Terrific!